The story takes the form of a series of letters from a senior demon, Screwtape, to his nephew, a junior "tempter" named Wormwood, so as to advise him on methods of securing the damnation of a British man, known only as "the Patient". Screwtape holds an administrative post in the bureaucracy of Hell, and acts as a mentor to Wormwood, the inexperienced tempter. 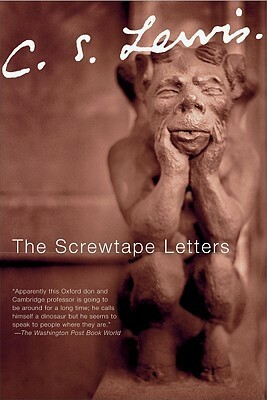 In the body of the thirty-one letters which make up the book, Screwtape gives Wormwood detailed advice on various methods of undermining faith and promoting sin in the Patient, interspersed with observations on human nature and Christian doctrine. Wormwood and Screwtape live in a peculiarly morally reversed world, where individual benefit and greed are seen as the greatest good, and neither demon is capable of comprehending or acknowledging true human virtue when he sees it. Why hadn't I finished this before? Maybe I wasn't in the right mood. Maybe I wasn't ready to pay attention. Maybe I hadn't found an audiobook reader I could stand. Well, it doesn't really matter because I have finally read The Screwtape Letters by C.S. Lewis. It's a look at human nature and a Christian worldview from a new perspective. Most Christian fiction, and Christian allegory, show the struggling believer who has an epiphany of faith that leads to a place of understanding and acceptance of their circumstances and the importance of their beliefs. As a Christian, I appreciate the message and the happy endings, but it never fully satisfies. Lewis tacked the topic from the opposite viewpoint, in many aspects taking the believer out of the story completely. He is there, of course, but we only get to know him through the eyes of the very creatures working furiously to turn his heart away from God. The simple letters, that sound like any letter between a mentor and his apprentice, detail moral struggles of humanity and the fight for the soul. I'm not sure I fully agree with the Goodreads description when it states that "neither demon is capable of comprehending or acknowledging true human virtue." An article I read on HarperCollins Publishers stated that the format of the book, a letter between demons seeking the soul of the "patient", "allows Lewis to reveal, at the patient moves precariously through one temptation after another, both what is required to maintain one's virtue and the precise nature of the forces of darkness deployed to destroy it." That feels more correct. The demons knew what they were up agains. They understood human nature, the good (in their perspective) and the bad, and thus understood precisely when and how a soul was lost. For a believer, C.S. Lewis's The Screwtape Letters is a great way to start a conversation about morality, virtue, faith, and the forces of darkness, the fallen and depraved, battling for our souls.